Franklin DeWitt Harris (born December 9, 1934) is a designer of helicopters and author of rotorcraft textbooks. He has conducted pioneering research in rotorcraft aeromechanics. At Bell Helicopter he led the development of the OH-58D Kiowa that serves in the U.S. Army aviation fleet. For the past fifty years, Mr. Harris has built the bridge between U.S. government-conducted and government-sponsored fundamental research and its application by industry’s designers and manufacturers. His service to advancing the field of vertical flight aeronautics is unmatched over the past 50 years and he has been the recipient of several international awards. Mr. Franklin D. Harris graduated from Rensselaer Polytechnic Institute, the nation’s oldest technological research university, with a Bachelor of Science degree in Aeronautical Engineering in 1956. He joined the Boeing Vertol Company in June 1956 and for thirteen years worked as a helicopter performance analyst, aeroelastic loads engineer, advance rotor airfoil developer, and rotor blade designer specializing in fiberglass composite materials. From 1969 to 1974, Mr. Harris was the Manager of the newly completed Boeing V/STOL Wind Tunnel Complex conducting research and development of rotorcraft through design, construction, and testing of small-scale helicopter and VTOL wind tunnel models. From 1974 to 1976, Mr. Harris was the Boeing Vertol Director of Research and Development and in 1976 became the Program Manager for the development of a new helicopter bearingless main rotor system that successfully flew on a BO-105 helicopter under a U.S. Army-sponsored effort. From July 1977 to January 1992, Mr. Harris held many positions at Bell Helicopter including Manager of Preliminary Design, Engineering Director for the Army Helicopter Improvement Program leading to the development of the OH-58 Kiowa scout helicopter, and Deputy for Technology and Advanced Development. His final position with Bell Helicopter was Vice President of the LHX SuperTeam Engineering leading engineering groups from both Bell Helicopter and the McDonnell Douglas Helicopter Company. Since retirement from Bell in 1992, Mr. Harris has served as a consultant and collaborator for many U.S. Government initiatives in close cooperation with the U.S. Army Aviation Development Directorate Aeroflightdynamics Directorate, AMRDEC, and the National Aeronautics and Space Administration. Basic Research Accomplishments in Rotorcraft: Mr. Harris conducted seminal analytical and experimental research into the analysis and design of helicopters and other VTOL aircraft. His studies have ranged from very basic aerodynamic flow analysis to configuration-dependent studies. His work over the decades spanned a variety of technical topics including radial flow effects on rotor blades (AHS Journal, 1966), rotor blade stall (AHS Journal, 1968), high speed rotor performance (AHS Journal, 1970), rotor flapping in forward flight (AHS Journal, 1972), fundamentals of rotor power consumption and vertical climb aerodynamic performance (AHS Specialists Meeting, 1987), transonic propeller rotor aerodynamics (NASA CR, 1996), twin rotor hover performance (AHS Journal, 1999), self-induced velocities generated by a rotor blade (NASA CR, 2006), and edgewise-flight slowed-rotor operation (NASA CR, 2008). Mr. Harris has also performed detailed assessments of early high speed rotorcraft such as the McDonnell Douglas XV-1 Convertiplane (NASA CR, 2003), proposed new high speed aircraft configurations (NASA CR, 2010), and even super VTOL compound helicopter retrofits (AHS Specialists’ Conference, 2010). His published work is the result of a keen understanding of the need to have engineering answers to pressing problems facing the rotorcraft analyst and the industry as a whole. Applied Research and Aircraft Development: Mr. Harris was a technical leader and manager of major aircraft design and development programs. He is best known for his leadership in the developing the Bell Helicopter OH-58D Kiowa scout helicopter with its distinctive mast mounted sight. This aircraft entered U.S. Army service in 1985. The OH-58D Kiowa led to international military sales and a subsequent significant upgrade to the Kiowa Warrior platform with weapon pylons on both sides of the aircraft. Mr. Harris was subsequently appointed to be the technical leader and manager of the Bell Helicopter/ McDonnell Douglas Aircraft Company/McDonnell Aircraft Company Light Helicopter Experimental (LHX) Program candidate design for the U.S. Army. The SuperTeam, under Mr. Harris’ direction, developed an advanced four-bladed bearingless main rotor and a NOTAR ducted tail rotor, with the entire aircraft (wind tunnel model) successfully tested at one-half-scale in the world’s largest wind tunnel complex. Helicopter Safety: With the increasing focus on operational safety aspects of civilian helicopters, Mr. Harris was the first to separate fact from fiction in a structured and comprehensive manner (NASA TM 2000) working closely with NASA and Army researchers. This definitive work was based on thousands of NTSB aviation accident reports. This research was expanded and lead directly to Mr. Harris’ 2006 American Helicopter Society International (AHS) 26th Alexander A. Nikolsky Lecture and resulting article (AHS Journal, 2007). In this seminal work, Mr. Harris identified the technologies necessary to dramatically reduce helicopter accidents and more importantly he listed ten actions that could be taken immediately by the rotorcraft community to improve safety for all vertical lift aircraft. Helicopter Operational Cost Modeling: Using his understanding of the helicopter industry and how helicopters were designed, manufactured, and used, Mr. Harris was the first senior industry leader to openly research and publish comprehensive cost drivers in helicopter costs for purchase and operation (AHS Vertical Lift Aircraft Design Conference, 1995; AHS Journal 1997). When economic competitiveness versus other aircraft alternatives became the cornerstone of future civilian rotorcraft market growth, Mr. Harris researched and prepared a comprehensive commercial airline operational cost model based on 40 years of Department of Transportation records for 67 airlines (NASA CR, 2005). This work was driven by the need to understand the economics of the commercial airline industry. If civilian rotorcraft were to expand and compete into existing civilian markets served by commercial airlines, fundamental understanding of the cost drivers in these existing business models must be understood. Boeing Vertol Company–June 1956 to July 1977: From graduation to August 1969, Mr. Harris served his apprenticeship in (1) predicting and measuring the aerodynamic performance of Boeing's first turbine powered helicopters, (2) predicting and measuring flying qualities of the world’s first tilt wing VTOL airplane, (3) finding efficient aeroelastic and structural solutions to helicopter loads, (4) applying fiberglass composite materials to helicopter rotor blades, and (5) developing advanced airfoils suited to helicopter rotor blades. From August 1969 to January 1974, he was Manager of the newly completed, multimillion dollar Boeing V/STOL Wind Tunnel Complex that became a world leader in the design, construction and testing of sophisticated, small–scale helicopter and VTOL wind tunnel models. From January 1974 to June 1976, as Director of Boeing Vertol Research and Development, he intensified R&D marketing activities and increased the dollar value of government research contracts awarded to Boeing Vertol. From June 1976 to July 1977, Mr. Harris was Program Manager for the development of a new helicopter bearingless main rotor system designed to reduce helicopter operating costs per flight hour. Bell Helicopter Textron Inc.–July 1977 to January 1992: Frank Harris joined Bell in July 1977 and was Chief of Aerodynamics Technology until October 1979. From October 1979 to June 1980, as Manager of Preliminary Design, he helped establish firm directions that both helicopter and tilt rotor product lines would take in the future. Particular emphasis was placed on the light helicopter product line that led to a four bladed Model 406L light twin helicopter and the OH 58D. From June 1980 to March 1986, he was Director, AHIP Engineering. This Army Helicopter Improvement Program developed the OH 58D scout helicopter. The aircraft and the program are pointed to as one of the best (on schedule, within budget, and met spec) examples of Army aviation procurement. As chief engineer Mr. Harris directed the overall technical approach and engineering business for BHTI and guided the engineering efforts of the team members who provided major subcontracting efforts to the program. From March 1986 to January 1988 he was part of a broad program to develop succession potential within the BHTI Engineering Department. The initial position was Deputy Senior Vice President, Research and Engineering and then later as Deputy for Technology and Advanced Development, reporting to the Senior Vice President, Research and Engineering. From January 1988 to January 1992, he was the Vice President of LHX SuperTeam Engineering which required him to lead the engineering groups from Bell Helicopter Textron, McDonnell Douglas Helicopter Company and McDonnell Aircraft Company. The SuperTeam formed by these three companies competed against a team formed by Sikorsky Aircraft Company and Boeing Helicopter Division to win a program that would develop a new prototype Army helicopter. The Army awarded the program to the Boeing/Sikorsky team on April 5, 1991 on the basis of lower cost and better supportability aspects. Consultant–January 1992 to Present: Upon retirement from Bell, Mr. Harris became associated with NASA/U. S. Army rotorcraft activities at NASA Ames in California. Currently, he spends several weeks a year at Ames and additional time at home working on technical studies funded by the NASA/Army group. He maintains an active consultant practice helping both major and minor aerospace companies. Awards: Mr. Harris has received numerous recognitions from the American Helicopter Society and the NASA. 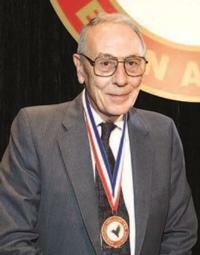 In 1980, Mr. Harris was elected as an AHS Honorary Fellow. In 1986, Mr. Harris received the AHS Grover E. Bell Award for his development of the OH-58D scout helicopter. As Chief Engineer he directed overall technical approach and engineering business for Bell Helicopter and guided engineering efforts of team members including major subcontractors. Mr. Harris received the 2006 26th American Helicopter Society Alexander A. Nikolsky Honorary Lectureship. The Lecture entitled “No Accidents — That's the Objective,” was delivered in May 2006 at the 62nd Annual Forum of the American Helicopter Society in Phoenix, AZ. The lecture provided an historical perspective for viewing rotorcraft accidents using FAA and detailed NTSB records. With Mr. Harris’ broad perspective on helicopter design, manufacture, and operations, Frank concluded not with recommendation, but with a specific list of 10 immediate actions that should be taken to dramatically reduce rotorcraft accidents. In 2009, Mr. Harris received the NASA Public Service Medal, the highest form of recognition awarded to any non-Government individual whose distinguished service has personally contributed to NASA’ advancement of United States’ interests. The short citation for the Medal read “for technical leadership, research, and collaboration with NASA rotary wing technology science and technology development”. Mr. Harris received the 2013 American Helicopter Society John J. Schneider Historical Achievement Award. This award recognized Mr. Harris for the documentation and preservation of our rotorcraft heritage and history in his sole-authored NASA SP-2011-215959 volumes entitled Introduction to Autogyros, Helicopters, and Other VTOL Aircraft Volume I: Overview and Autogyros and Volume II: Helicopters. In 2015, Mr. Harris was recognized with the Dr. Alexander Klemin Award from the American Helicopter Society. This award is the highest honor the AHS bestows on an individual for notable achievement in advancing the field of vertical flight aeronautics.